Good morning, ladies and gentlemen. 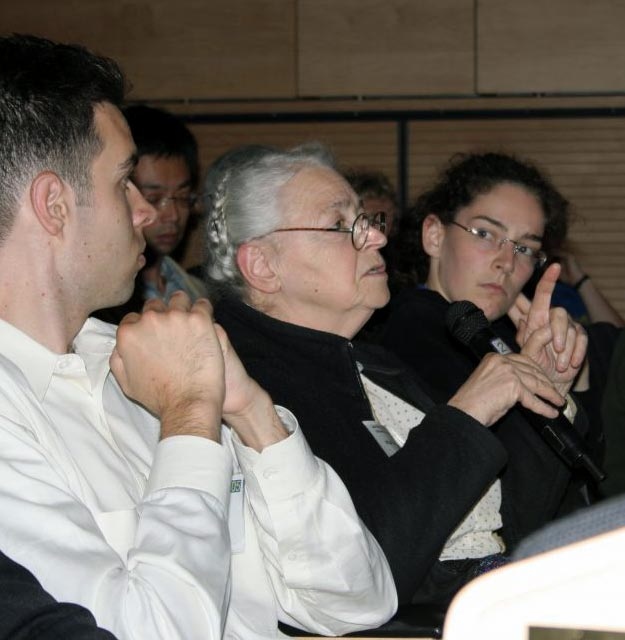 It’s my great honor be the very first speaker in this MRS memorial day for Professor Millie Dresselhaus. I'm currently working in two laboratories. This is because I just started a new laboratory called ‘the Low Dimensional Materials and Devices laboratory’ at Tsinghua-Berkeley Shenzhen Institute (TBSI). This Institute was established by Tsinghua University and UC Berkeley, and it’s supported by the Shenzhen local government. 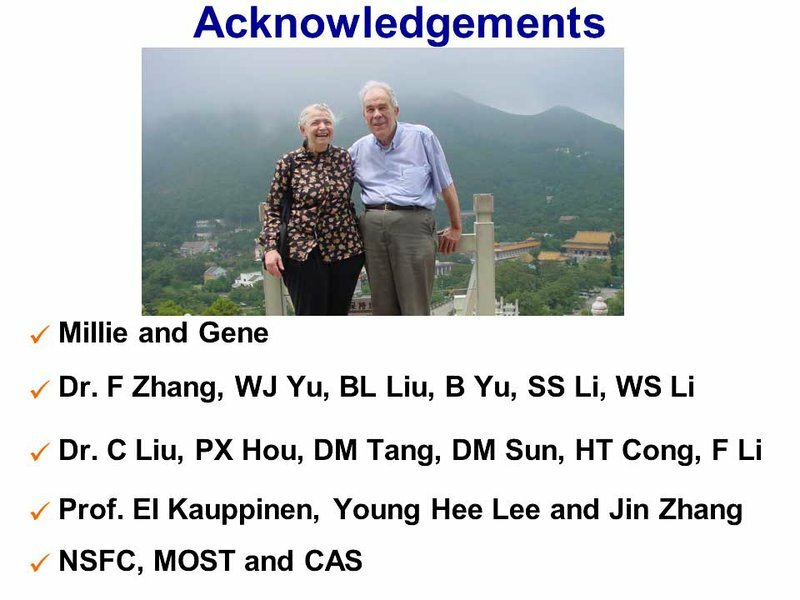 I have been at Shenyang’s lab for many years, and I’m still working here — on advanced carbon research. I wasn’t at Millie’s group for very long — about six months, or maybe a little less. I was there from November, 1997 to May, 1998. This is a picture from Marcos Pimenta. You can see Steve Cronin in this picture, too — he is with University of Southern California. And I'm also in the picture! See me? At that time, I was quite young. I joined Millie's group on November 27, 1997. That means I joined MGM exactly 20 years ago. It was a good memory for me. I learned a lot from Millie and my time at MGM, even if it was a very short period of time. 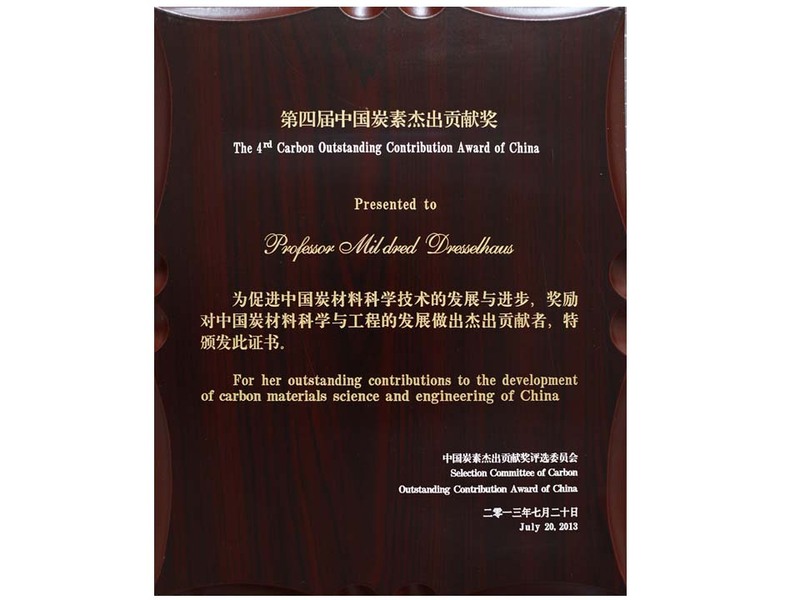 After I left MGM and returned to China, I worked on carbon materials. At first, I researched carbon nanotubes, and later on, I began to look at graphene. Millie was very supportive. She visited my laboratory several times. Millie was very impressive. 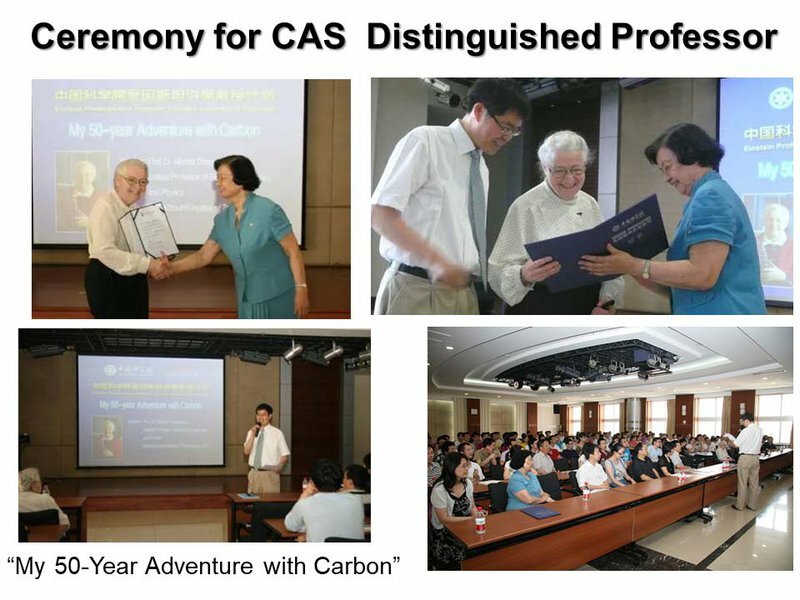 She even received a distinguished professorship from the Chinese Academy of Sciences — a very high honor for a scientist, since every year, only about 10 people receive this professorship. This is the former director of my institute. 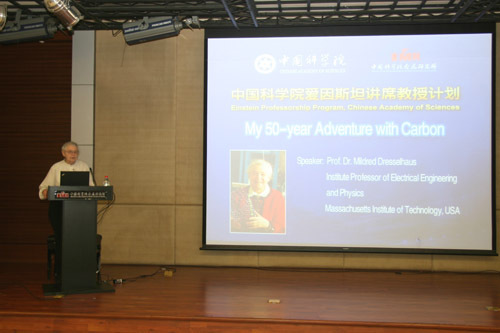 I’m chairing lecture given by Millie on “My 50 year Adventure with Carbon”. That was the title of Millie’s talk. 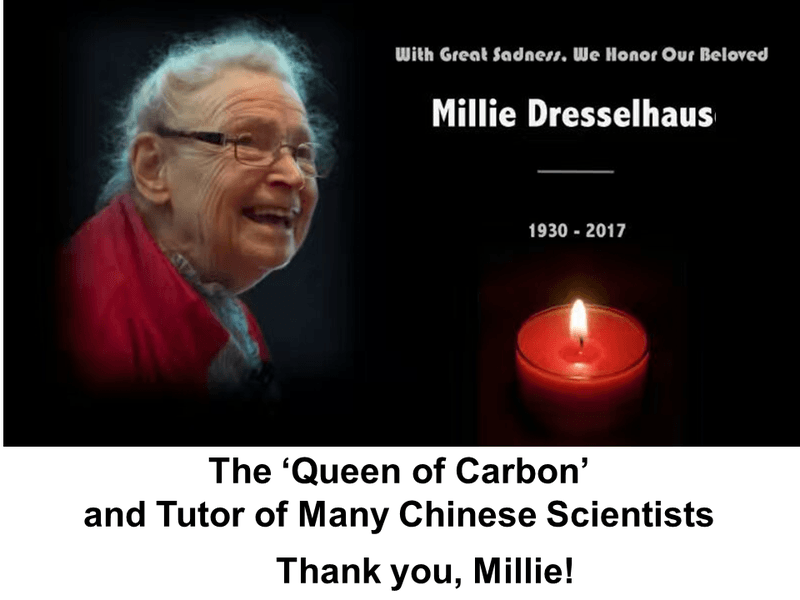 Millie also contributed a lot to the development of carbon science in China. 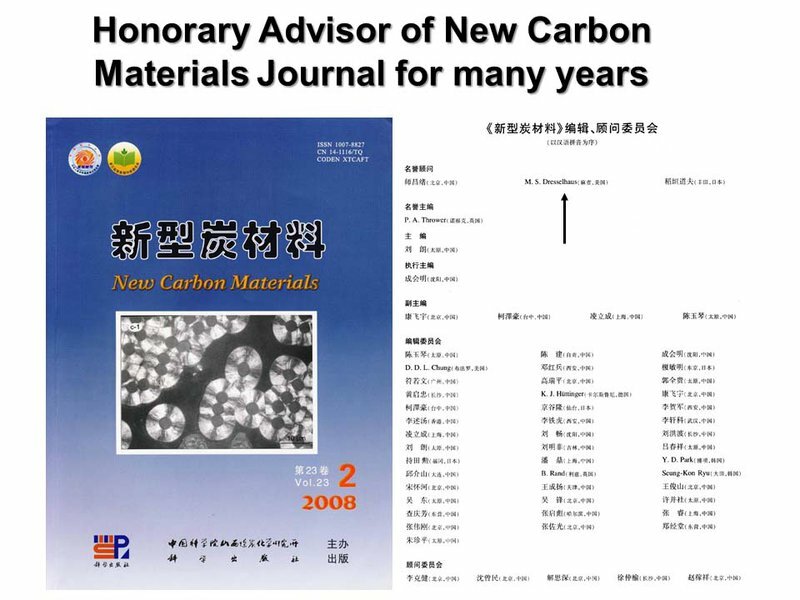 For example, I was the Editor-in-Chief of the New Carbon Materials. Millie has been the honorary adviser to this journal for many years. To honor her contribution, the Chinese Carbon Society decided to present Millie this award, four years ago. It’s the first Carbon Outstanding Contribution Award. So, I joined the Millie’s group to work on carbon nanotubes. 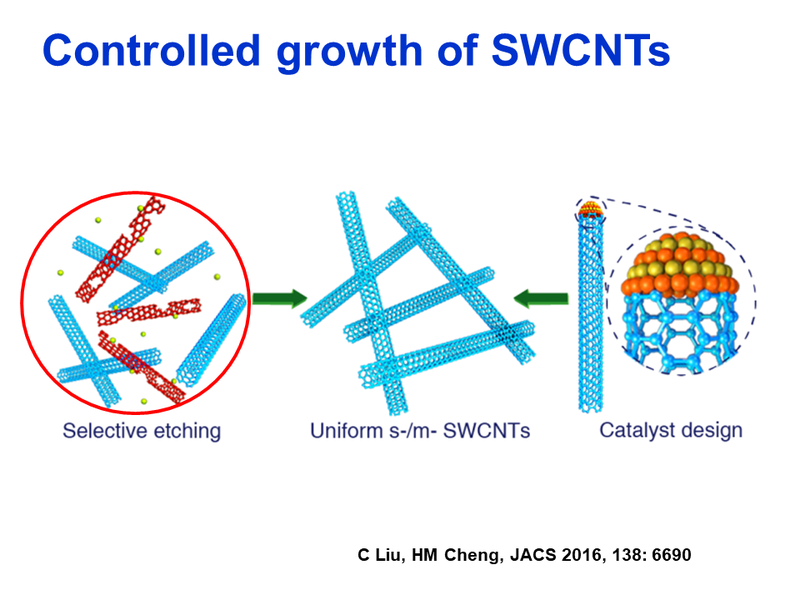 We were working on the synthesis of high quality carbon nanotubes — in particular, single-walled carbon nanotubes — and then controlled growth for single-walled carbon nanotubes. 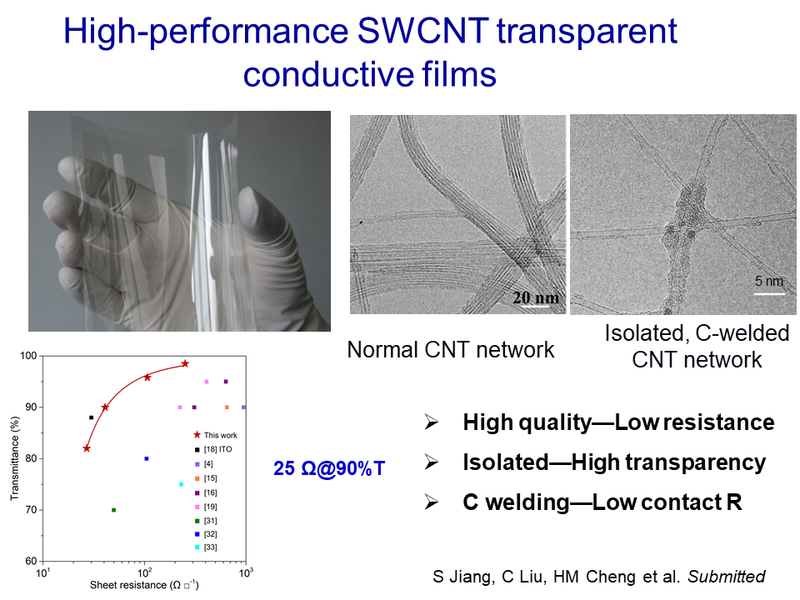 We also tried to find some applications for carbon nanotubes from commercialized lithium ion batteries, and thin-film transistors to transparent conductive films. I’m very happy because I published the first paper on single-walled carbon nanotubes by floating catalyst CVD. It’s this paper. It says that synthesizing single-walled carbon nanotubes does not require a lot of skill and can be low-cost and affordable. One of the corresponding authors was Millie. 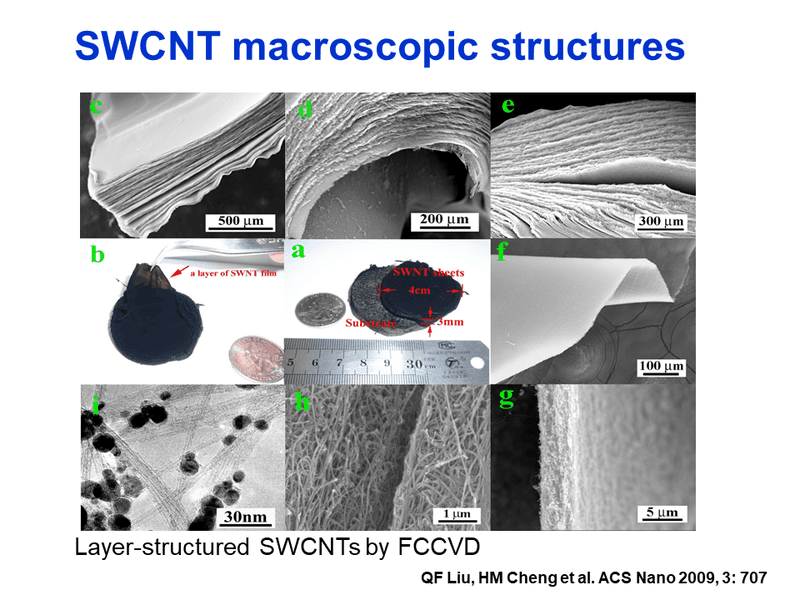 Actually, you see over here, I collaborated with Xiangdong, Marcos and others to publish this paper, which is the first paper on synthesis of single-walled carbon nanotubes by CVD. 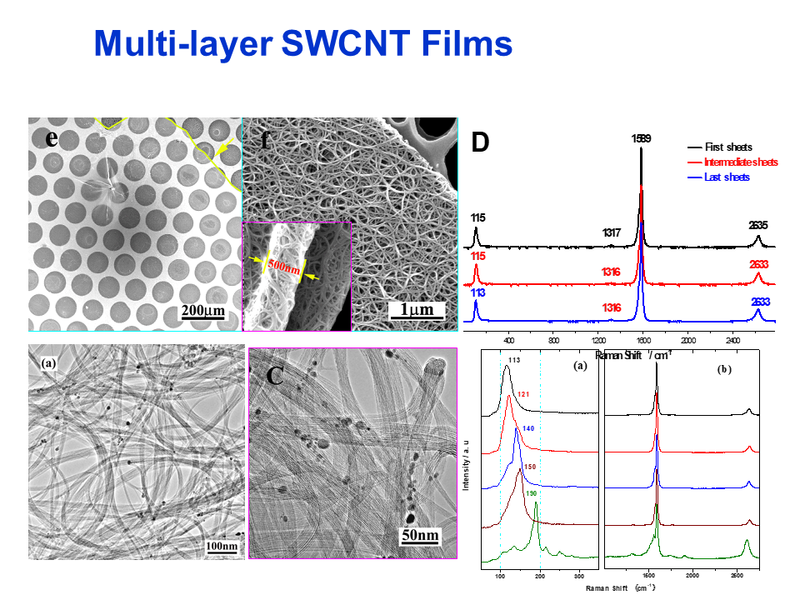 Two months later, Xiangdong, Sandra, Marcos, Alessandra, and Gene and Millie collaborated on another paper on the bulk morphology and the diameter distribution of single-walled carbon nanotubes. It was published in Chemical Physics Letters. It was also my second paper on carbon nanotubes, and it made me even happier than the happiness I felt over my first! Why was this so exciting? Because Professor Richard Smalley, himself, read this paper and sent an email to Millie saying he recommended this paper for publication with his highest compliments! As a result, the paper was published very quickly. 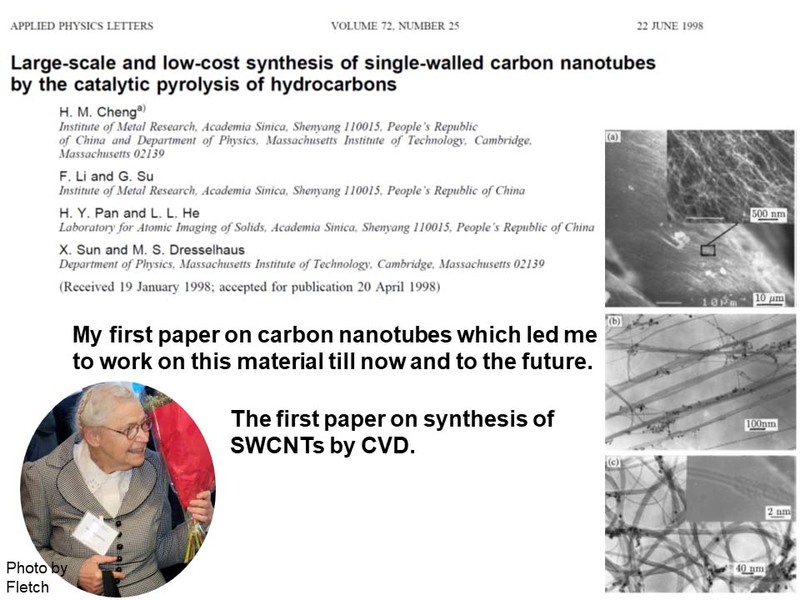 Both of these papers helped promote the synthesis of single-walled carbon nanotubes by floating catalyst CVD. 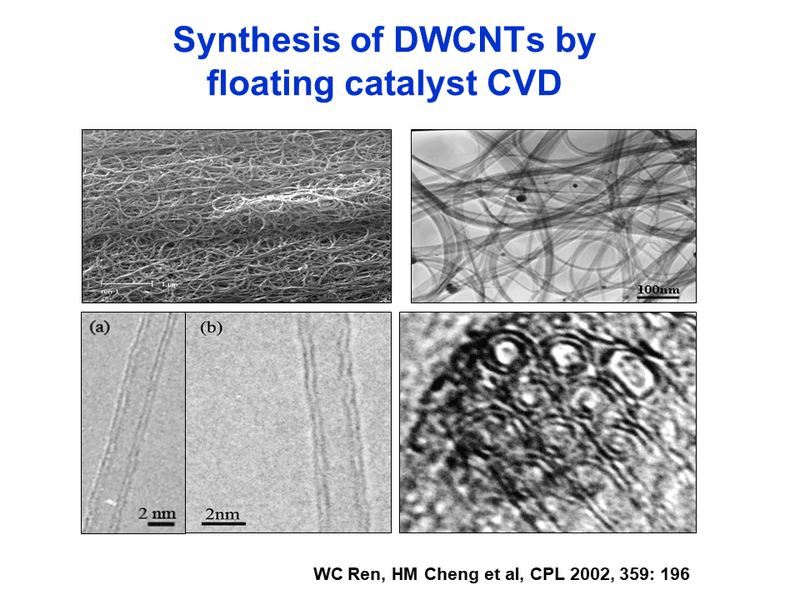 Floating catalyst CVD was invented by Professor Endo (Endo-sensei) for synthesis of a wide variety of carbon fibers. So we use the same approach by tuning the synthesis conditions. By using benzene as the carbon precursor, ferrocene as catalyst precursor and thiophene as the growth promoter, we can create a very nice single-walled nanotube of extremely high quality. 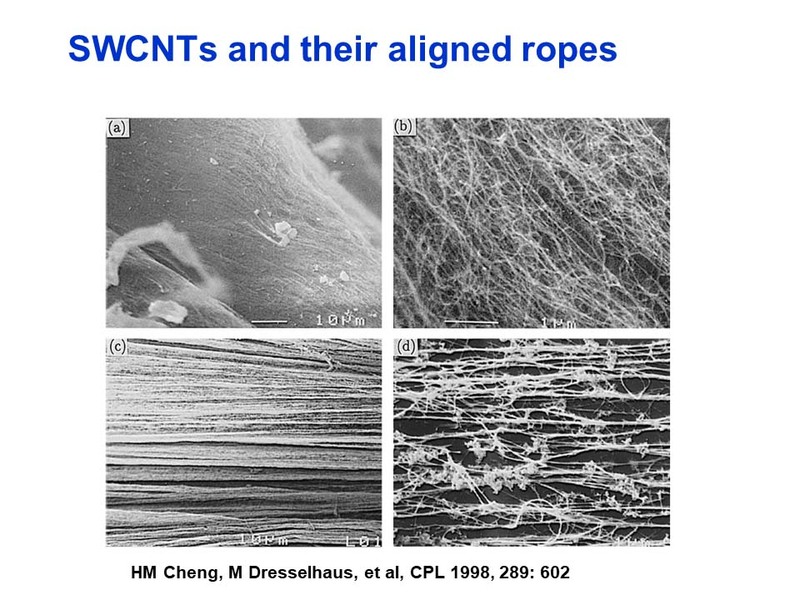 We can also, by the way, create aligned single-walled nanotube ropes! This process has potential for continuous preparation (which I will show you later), and it also has the possibility to control the structure at a very high rate of purity, but for a very low cost. We demonstrated this here, on our earlier paper. We can create single-walled carbon nanotube ropes, or we can create ribbons. 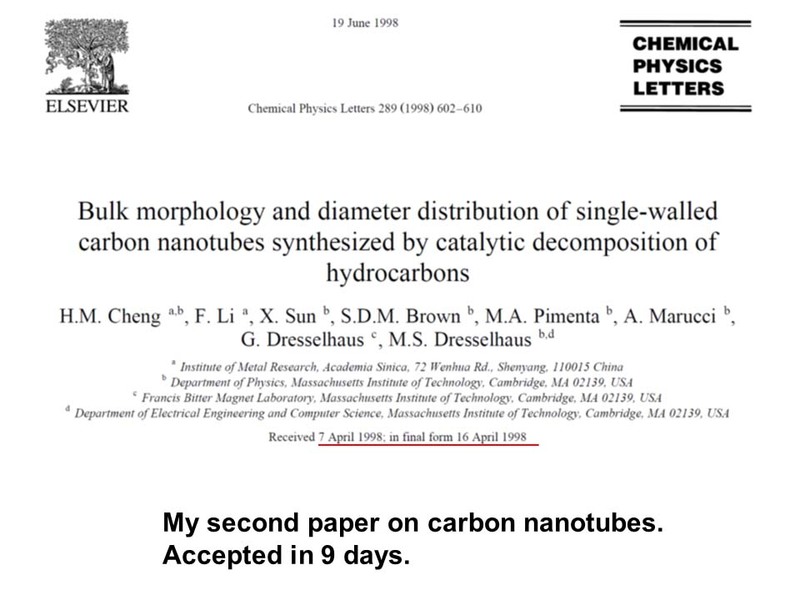 A few years later, using a similar process, we synthesized double-walled carbon nanotubes. 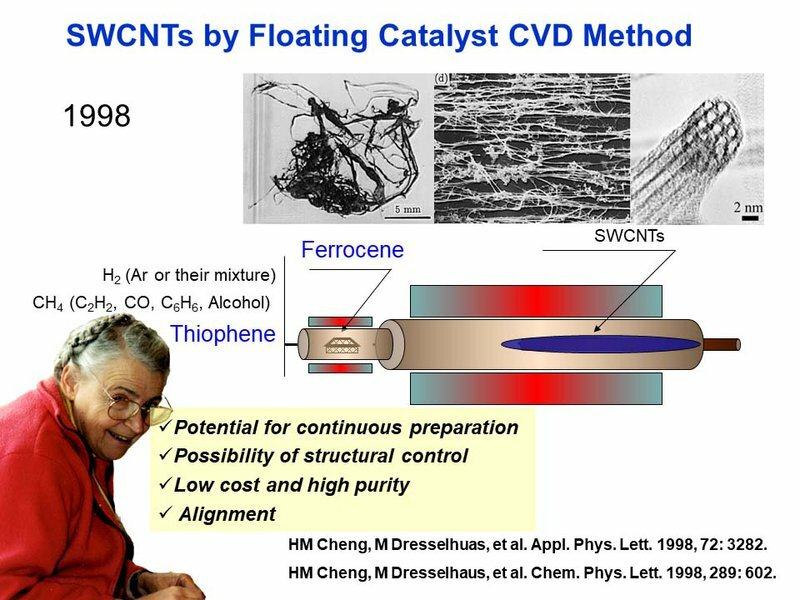 This was one of the first papers on synthesis, directly by CVD, for double-walled carbon nanotubes. We can also tune the process to get these kinds of macroscopic structures for single-walled carbon nanotubes. We can also get a thin film which can be used directly as transparent conducting thin films, which is a multilayer single-walled carbon nanotube thin film with high transparency and high electrical conductivity. 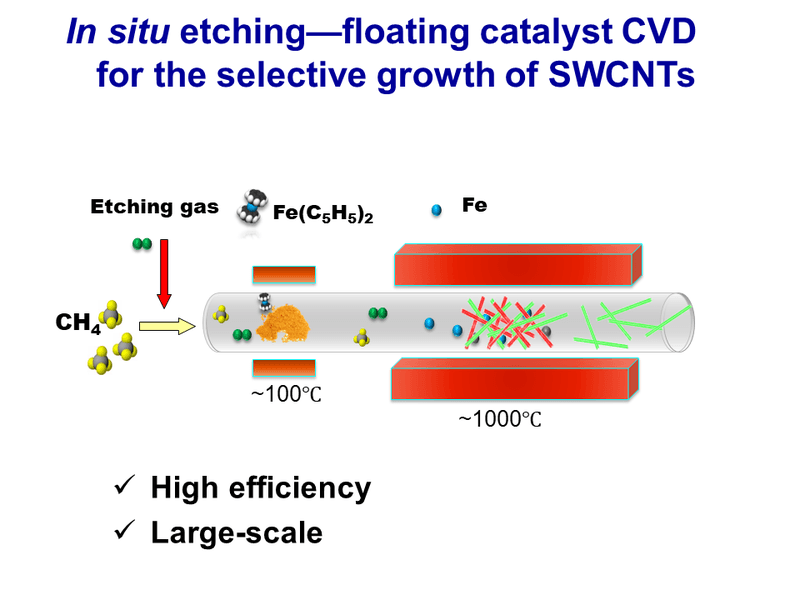 Moreover, by using this floating catalyst and CVD method, we can control the structure of single-walled carbon nanotubes based on selective etching — because the activity of metallic carbon nanotubes and semiconducting carbon nanotubes have some differences. Depending on these differences, we can selectively etch, for example, metallic nanotubes in a specific way that will turn it into semiconducting nanotubes. We also can selectively etch the semiconducting nanotubes in order to obtain metallic nanotubes. And this works well! The resulting etched nanotubes have a purity of more than 90%. As I show you, here, this is a similar process except that we add etching gas like hydrogen, water vapor, and other kinds of gases. This allows us to get high purity semiconducting nanotubes. 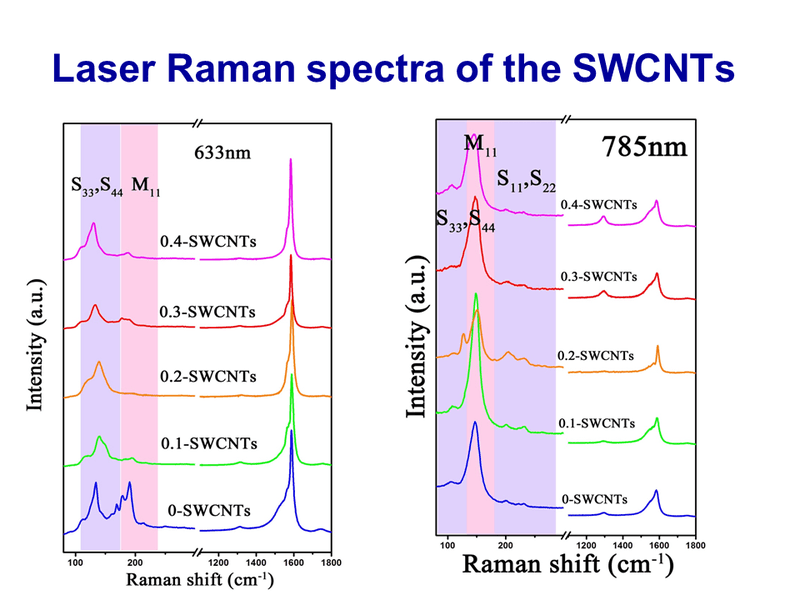 This is demonstrated in this Raman spectroscopic image, and it has also been proven with testing in the thin film transistors, as you can see below. 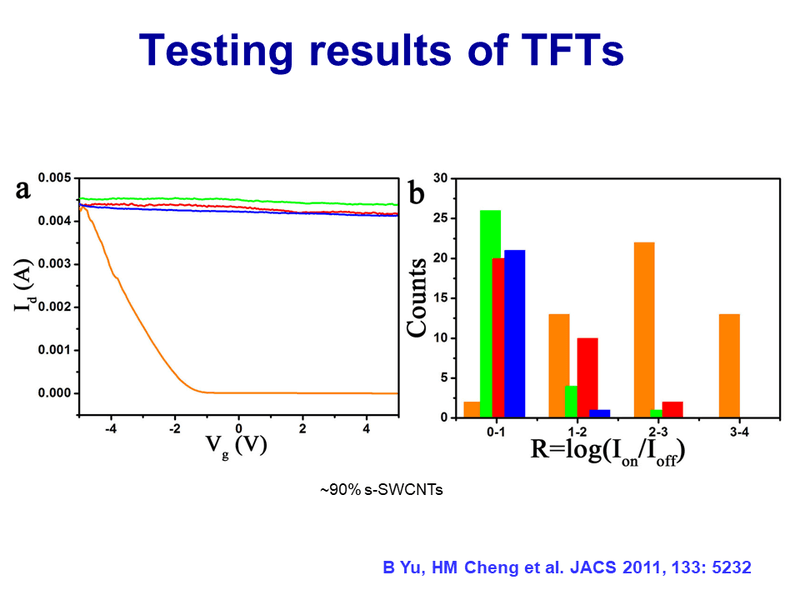 The on/off ratio for the semiconducting nanotubes is much higher than the mixed nanotubes, which shows us that the nanotubes would have a purity of around 90%. If we transfer this collection of nanotubes to a PET thin film, we can get transparent conducting films. The resulting film is 50 cm wide and (as I mentioned before) an unlimited length. If you want to get a film that is several meters long, we can do that! 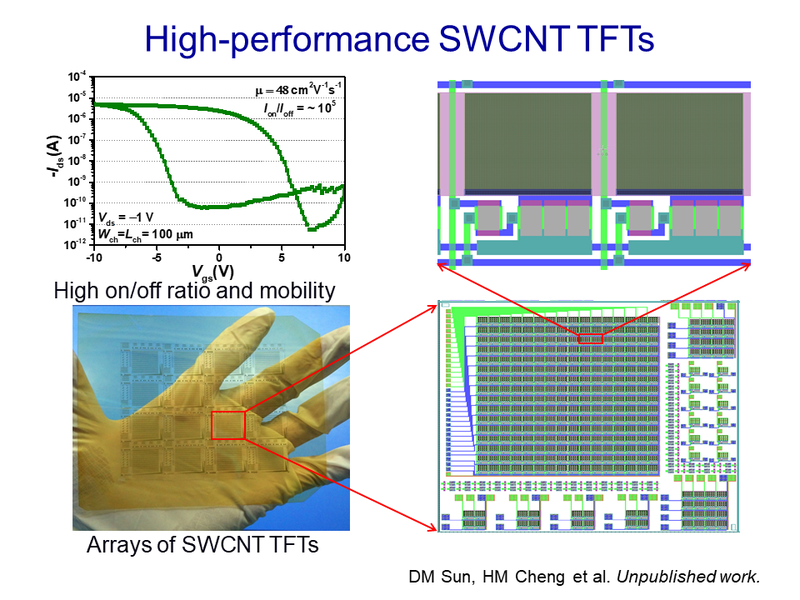 We can also control the density of the carbon nanotubes and then use this thin film to create single-walled nanotube thin film transistors with a very high performance. This is shown on the slide above. Thus, this array of TFTs has a high on/off ratio and a mobility of around 50. 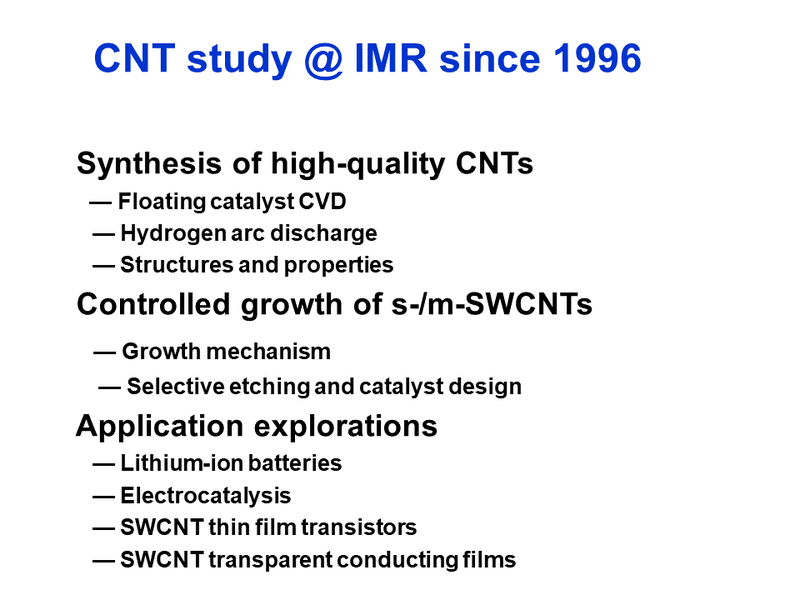 Also, we can use this process to produce single-walled carbon nanotube transparent conducting thin films that have a very high performance (also shown on this slide). The highest one can be around 25 ohms per square, at 90% transmittance. 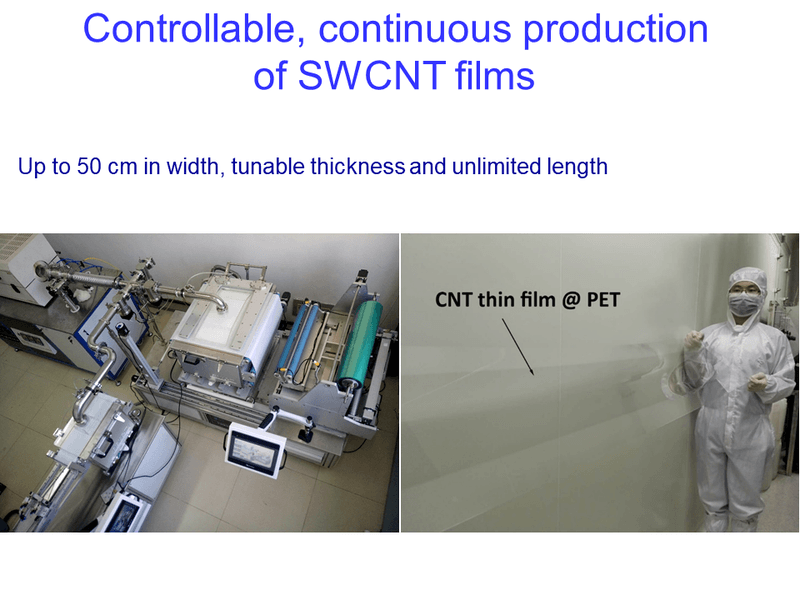 As you can see, this process can produce transparent conducting film with very high quality and, due to the highly isolated distribution of single-walled nanotubes, and carbon welding on all the overlapping points, which lead to a low resistance. 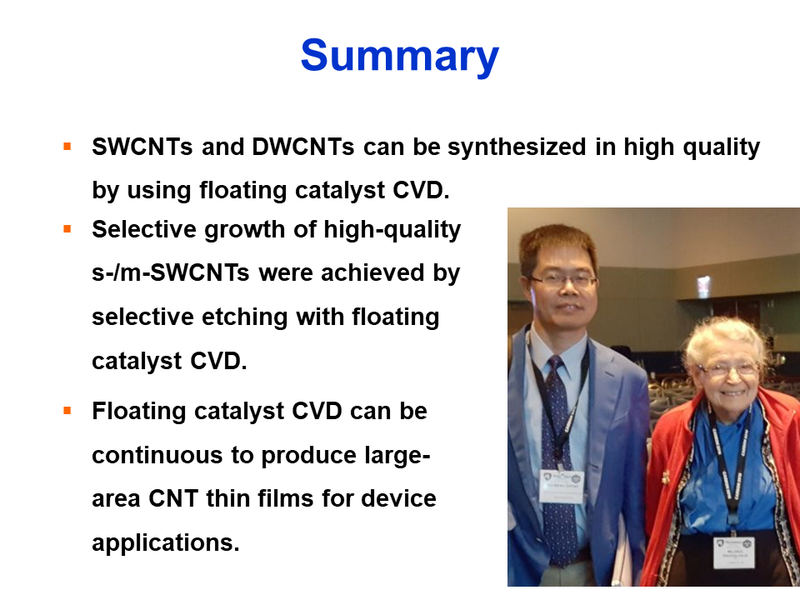 I just gave you a very short overview of what we have done to synthesize single-walled nanotubes and double-walled nanotubes using the floating catalyst CVD. We also can selectively grow high quality semiconducting or metallic nanotubes by this method, and we can continue to produce carbon nanotube thin films for device Applications. Of course, it has a lot of applications — so now, we are working with a company in order to commercialize this process. I would like to thank Millie and Gene very much for all their help and support, over the years. I would also like to thank Marcos and my other collaborators in those early years, and also all other PhD students and colleagues. Also, I would like to thank Esko, Yan Li, and Jin Zhang, with whom I’ve been working, recently, on carbon nanotubes. To conclude, I’d like to reflect on that first day when I entered the MGM group and the field of carbon nanotubes. True, I knew very little, but I was eager to learn and Millie was happy to teach. It turned out, while I was researching ways to synthesize carbon nanotubes, Millie’s constant kindness and encouragement was synthesizing, within me, a love for carbon science — and that love has an extremely high percentage of purity! Esko Kauppinen: We have a lot of time for questions. Is there anybody? Question Asker: I want to ask Hui-Ming, when Millie went to China and you took her all over the place, what was she interested in seeing with you? Hui-Ming Cheng: As you know, Millie is always working. Always! Even when she got a stomach bug on her trip — she still insisted on working! She would come into my lab, to discuss physics with my students, and she pretended everything was fine. However, due to her insistence on constantly working, and the stomach bug, we only wound up touring two places. One is Shenyang. 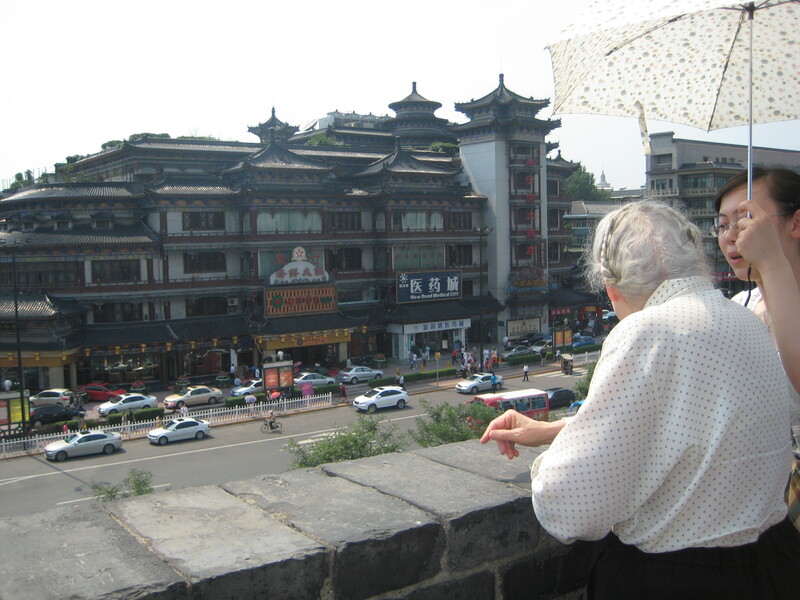 The other place is Xi’an, where we went to the Terracotta. Yeah. Millie was very impressed by the Terracotta. Esko Kauppinen: Another question, please? Question Asker: I have a question about the continuous… I mean, they put the carbon nanotubes on the PET substrate to get the very large area transistor films. So after you synthesize a single-walled nanotubes, do they directly deposit onto the surface of the PET film? Hui-Ming Cheng: We use a filter paper to collect the carbon nanotubes and then transfer it to the PET substrate. Question Asker: Oh. So do you add, perhaps, some binder between the carbon nanotubes and the PET film or something? Hui-Ming Cheng: No. We do not add binders or other things. We just dry transfer to the PET substrate. Question Asker: Okay. I saw very low surface resistance and very high performance. Thank you. Hui-Ming Cheng: Yeah, and actually the low resistance is due to this dry process, which means we have isolated single-walled nanotubes. There’s normally a bundle, but for our sample, you can see many of nanotubes are isolated (not forming a bundle). This makes the film highly conductive. Esko Kauppinen: OK. I don't see any more burning questions, so let's thank Hui-Ming once more. And then we will continue onwards, in our talks on carbon nanotubes. Let’s look a little at measurement and Raman — since Millie did so much work with Raman spectroscopy.